It also aids in the treatment of scratches, wire cuts, mud fever, skin irritations and other skin disorders in horses. 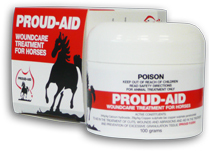 Proud-Aid is a smooth textured paste that is easy to apply and is non irritant to the horse. It helps protect from gross contamination and invasive dirt from entering the wound. Proud-Aid dries rapidly, stays in place and can be used without bandaging.